Connect to Google Analytics and enable tracking to see how your Mailchimp subscribers interact with your website. After you send an analytics-enabled email campaign, we'll collect and display your campaign's results in Mailchimp reports and in Google Analytics. In this article, you'll learn how to view Mailchimp email campaign data in your Google Analytics account. In your Google Analytics account, the term "campaign" has a unique meaning. A Google Analytics campaign is a marketing promotion that might include pay-per-click ads, affiliate links, email marketing, and more. Since Google Analytics campaigns span many types of communication, you'll probably need to sort and filter campaigns to show only emails. For more detailed explanations and troubleshooting assistance, visit Google's Analytics support page. To locate your Mailchimp campaign in Google Analytics, follow these steps. 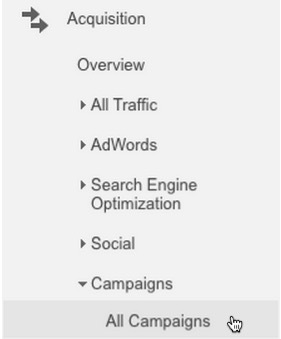 In the left navigation, click Acquisition and choose Campaigns from the drop-down menu. Browse the campaigns, and click your Mailchimp campaign's title to open the report. In Google Analytics, each tracked Mailchimp campaign has a unique title, and it's typically formatted in one of two ways. You may not see your Mailchimp campaigns on the first All Campaigns results page because Google Analytics provides so much data in this table. To make your campaign easier to find, sort and filter the campaigns. First, set up a secondary dimension to sort the campaigns by medium. Medium is a category that describes how visitors navigate to your site, like email, paid web search, or referral. Next, create a filter to display emails only. The filter will narrow down the results list to only include campaigns whose medium is email. After you've sorted the results and applied the filter, browse the emails for your campaign title, and click the title to view the report. 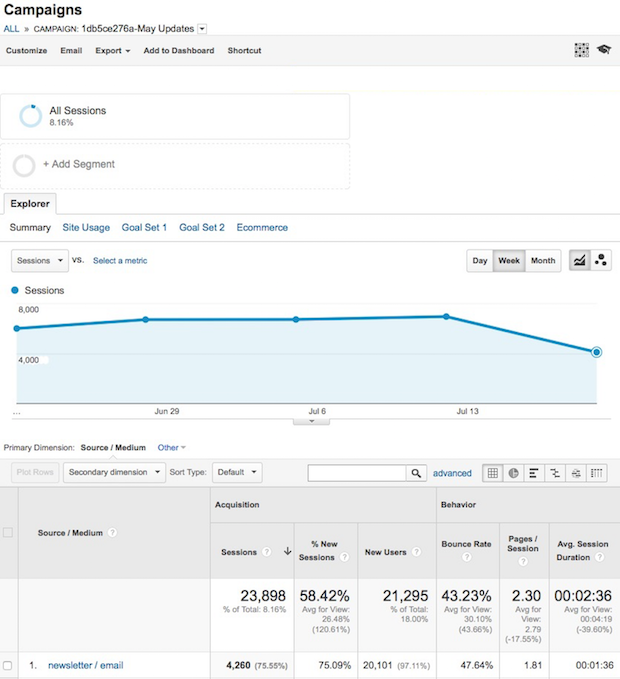 The Google Analytics campaign report will display many statistics, like the number of website sessions that your Mailchimp campaign generated, session duration, and page views per session. If your Google Analytics account is set up to track purchases or conversions, your campaign report will also include purchase data on the report's Explorer tab. Depending on how you set up tracking, your statistics will appear in the Ecommerce section.